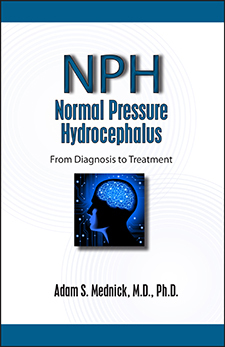 By Adam S. Mednick, M.D., Ph.D.
Normal pressure hydrocephalus (NPH) is a neurological disorder that results from an abnormal build-up of cerebrospinal fluid in the brain. The pressure caused by this fluid results in three primary symptoms: unsteadiness when walking, incontinence, and mild dementia. The disorder typically affects the elderly. Unfortunately, NPH is misunderstood and is often misdiagnosed as other diseases such as Parkinson’s disease or Alzheimer’s. It is estimated that nearly 375,000 Americans have NPH, but only about 11,000 have been treated. However, with the surgical insertion of a shunt in the brain, the symptoms can often be reversed. The first link below shows video of an NPH patient walking before shunt surgery. The second dramatic link shows him walking after he received a shunt.